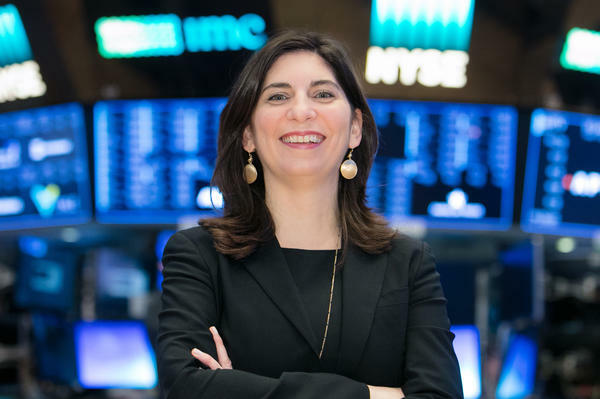 Stacey Cunningham, 43, is set to lead the New York Stock Exchange as the first female president in its more than 200-year history. For the first time since the group was established in 1792, the New York Stock Exchange will be headed by a woman. While Stacey Cunningham realizes she's shattering a 226-year-old ceiling, she says she didn't consider her gender as a huge factor when it came to pursuing opportunities that led her to break into the top ranks of the male-dominated finance industry. "In large part, I have the people that preceded me to thank for that," she tells NPR's Lulu Garcia-Navarro. "And while I didn't know it at the time — and I never had met them or other women that had entered the financial market space and really trailblazed — they're the ones that helped define my career because I didn't have to think about it." Cunningham, who's transitioning from her position as the NYSE Group's chief operating officer, thinks her female predecessors offer an important lesson to younger generations who are exploring career paths. "If you're willing to push the boundaries, you're helping all those that follow you." She says she certainly thinks about her gender now. In her high-profile position, she wants to build a diverse team. "I think the more women you have in an industry, the less likely we are to struggle with people not being treated appropriately. So if we focus on having more diversity in our industry, I think we'll be better off. " Our goal is to help companies raise money so that people who have an idea — an entrepreneur, a dreamer — can scale that idea and make it available to the masses, not just the few with means. There's always going to be a need for companies to raise money. ... We do it a little bit differently now — there are global companies that are coming to us, there are technology companies. We are the largest listing venue for exchange traded funds and exchange traded products. So, I don't see that slowing down. I think if we're waiting until people are considering careers, we've waited too long. I recently had a conversation with my cousin, who was relaying a story that her daughter had been talked out of joining a robotics class because she would be the only girl in the class and she'd get make fun of — even though she was passionate about robotics and really enjoyed it and was really good at it. We need to help [youth] realize that they can do whatever they want and to follow their passion. If you love what you do, you're much more likely to be successful at it, and to drive change and real success in your business. That's what we want people to be thinking about is not what gender lines they ought to be following but what passions they ought to be following. I think the more women you have in an industry the less likely we are to struggle with people not being treated appropriately. So if we focus on having more diversity in our industry, I think we'll be better off. I'm focused on building a team that is a very diverse team with diverse backgrounds. We just announced this week that Betty Liu would be joining the New York Stock Exchange as the executive vice chairman. Betty and I are both women, but we have entirely different backgrounds, entirely different experiences. I think it's important to build a team with different backgrounds and experiences with different perspectives, and very often, then, you're going to see that you've built a team that has different gender profiles, different race profiles, different socioeconomic backgrounds. But the driver needs to be having a really well-balanced perspective as an organization. NPR's Denise Guerra and Ed McNulty produced and edited this story for broadcast. Emma Bowman adapted it for the Web. There's a new head of the New York Stock Exchange, and for the first time in the history of the NYSE, it's a woman. That history, by the way, stretches back to 1792. Stacey Cunningham is president of the NYSE group, and she joins me now from New York. Congratulations, and thank you so much for joining us. STACEY CUNNINGHAM: Thank you, Lulu, and thank you for having me on. I'm so excited to be here. GARCIA-NAVARRO: So let's start with what the stock exchange is as a company and what it means to sort of head that up. Do you see yourself as a referee, as a corporate booster - what? CUNNINGHAM: Well, you know, our role has been the same really for the past 226 years. Our goal is to help companies raise money so that people who have an idea, an entrepreneur, a dreamer, can scale that idea and make it available to the masses, not just the few with means. GARCIA-NAVARRO: So I just want to take you to this particular moment because we've had a real run on the stock exchange of big growth, and there is, of course, a lot of speculation about whether it can continue, whether it's overvalued. I mean, what's your take? CUNNINGHAM: There's always going to be a need for companies to raise money, and that's what we're here to do, and it's been that way for literally over two centuries. We do it a little bit differently now. There are global companies that are coming to us. There are technology companies. We are the largest listing venue for exchange-traded funds and exchange-traded products. So I don't see that slowing down. GARCIA-NAVARRO: I'd like to talk about your gender. I mean, I have to put it just like that because, you know, finance is still a male-dominated industry, and I just want to know what it took for you to make it in this very, you know, male-dominated world. CUNNINGHAM: For me, it was never about my gender. I never even thought about it. It wasn't top of mind. I didn't think about the fact that I was a woman and whether or not there were opportunities available to me or not. In large part, I have the people that preceded me to thank for that. And while I didn't know it at the time and I never had, you know, met them or other women that had entered the financial market space and really trailblazed (ph), they're the ones that helped define my career because I didn't have to think about it. So I think that's an important lesson for everyone who is looking at exploring new opportunities. If you're willing to push the boundaries, you're helping all those that follow you. So gender really wasn't an issue for me. I never really thought about it. I certainly think about it now, especially over the past couple of weeks as I've gotten so many heartfelt messages from people around the world thanking me for pushing the boundaries from their perspective and that it might help them in the future and motivate and inspire their daughters. So I think about it. GARCIA-NAVARRO: As has been widely reported, though, finance really hasn't had a sort of #MeToo reckoning as such. Should it, do you think? CUNNINGHAM: I think the more women you have in an industry, the less likely we are to struggle with people not being treated appropriately. So if we focus on having more diversity in our industries, I think we'll be better off. GARCIA-NAVARRO: And where do you see your role in that? CUNNINGHAM: When I look at building a team, I'm focused on building a team that is a very diverse team with diverse backgrounds. I mean, we just announced this week that Betty Liu would be joining the New York Stock Exchange as an executive vice chairman. Betty and I are both women, but we have entirely different backgrounds, entirely different experiences. I think it's important to build a team with different backgrounds and experiences with different perspectives. And very often then you're going to see that you've built a team that has different gender profiles, different race profiles, different socioeconomic backgrounds. GARCIA-NAVARRO: I mean, it's interesting hearing you say that you never thought about your gender because what you've just described is something that women often bring to a high-profile job, that idea that there needs to be a diversity of opinion and not everyone should come from the same background and look the same way. Is that something that has been sort of a driver in your career? Now that you're in the top job, do you think, OK, this is a time for some changes? CUNNINGHAM: Yeah, and I definitely think I have a different perspective as a woman. It's not that I don't think my gender has influenced my views or my career at all. It just wasn't what I thought about first. If I were to give you a list of things that would describe me, I probably would get pretty far down the list before I would get to the fact that I'm a woman. But that doesn't mean that the things that do define me aren't influenced because I'm a woman. So I think it's really important to recognize that. GARCIA-NAVARRO: I guess my last question is you mentioned that you got a lot of notes and a lot of people congratulating you. Is there something that stuck in your mind that really touched you? CUNNINGHAM: I was really touched by the letter I received from the senior executive female leadership team at J.P. Morgan. It was touching, and a number of those women are role models for me. And I have followed and respected their careers and their approach to their leadership style. So it was really nice to receive that letter. GARCIA-NAVARRO: Stacey Cunningham, new head of the New York Stock Exchange, congratulations again, and thanks so much for being with us. CUNNINGHAM: Thank you, Lulu. Transcript provided by NPR, Copyright NPR.